Best Line #1: Despite our circumstances, no key ingredient of happiness is missing. Best Line #2: In devising our life plan, what should be our grand goal in living? It should be the attainment of satisfaction. Every time I recommend this book to people, they think I’m referring to some kind of tawdry romance novel. The word “desire” has strange connotation in this way. It’s seldom used in our daily parlance the way it’s used in this book. No one seems to “desire” a cheeseburger. They just want one. “Want” and “desire” are synonymous, of course; they are the two words to describe the same impulse. Desire feels like the more serious term. And more dangerous. Again, no one seems to “desire” a cheeseburger. But if someone has an affair, that’s the result of desire. So I like the fact Irvine uses the term so prominently because we should treat our wants, our cravings, our goals in such a manner. They are desires. Serious, potentially-dangerous, tempting, alluring, crazy-making desires. As always, these articles convey some really important ideas from the book but barely scratch the surface of all the rich knowledge the author provides. For today’s review, I’ll examine a couple more themes but a solid majority remains to be discovered. I hope you’ll read this work. It can be the first step towards the one desire we probably all have and fail to find: satisfaction. In my review of the book Essentialism, I featured many of Greg McKeown’s fabulous ideas on how to eliminate all the busy-work and noise that we suffer in our daily lives. One example is the idea of the “reverse pilot”, an exercise where you stop something and examine the results. Most normal “pilot programs” are a way of spinning something new into action and seeing if you get some manner of success. It should stand to reason that stopping something unimportant can be as successful as starting something that is. An example is email. What if you stopped reading email for an entire day? I know that feels like some sort of office sabotage. But try it. Or try eliminating Facebook. Apparently, it has great benefits and is thus a worthy pilot. I’ve never tried it but I’ve read this new, well-conducted study and it’s quite sensible. Why, exactly, is it a good idea to eliminate Facebook? The researchers mention a decrease (not drastic but still a decrease) in “political polarization and news knowledge, and an increase in subjective well-being.” Makes sense to me. People talk all the time of the polarity — about how so many people are so salty, so divisive in their commentary on the news. There is a very real “pro wrestling” effect that appears to take place with the whole thing; characters from the news reports are puffed up and Facebook is the giant arena theater where people go to gin up some anger and make loud noises at the bad people in the other corner of the ring. Is this anger real? Yes and no. I know firsthand of people who act terribly on social media and are completely normal outside of it. Which is why I think of pro wrestling. And specifically, an aunt of mine who would turn into a totally different person when she watched her favorite wrestlers on the weekend WWF shows. There was clearly something cathartic about that spectacle for her. She loved certain characters and would get visibly, physically shaken by the drama as they would fight, thrash, fall, and get up again. The whole thing was a big release, a way to exorcise the frustrations of the week. She’d smoke a cigarette afterward and resume normal life. Anyway, back to this week’s book. I mention Facebook and the aftereffects for those who stop using it because (a) it’s a fine example of McKeown’s “reverse pilot” and (b) the origin of all this suffering isn’t Facebook itself but the desires that are amplified by its use. If people did not desire for others to be like them, did not desire for control of all circumstances, did not desire status quo, and did not desire to have these feelings be heard, then I’m not sure any of this would be an issue. We should sort through these things. We should reverse pilot a number of the desires we feel. We should suppress at least as many desires as we seek to fulfill. There is no instant cure for unwanted desire. Overcoming desire is a long, slow process and those participating in it will periodically experience setbacks. Anyone who wishes to deal with desire must adopt semiarbitrary rules for living. 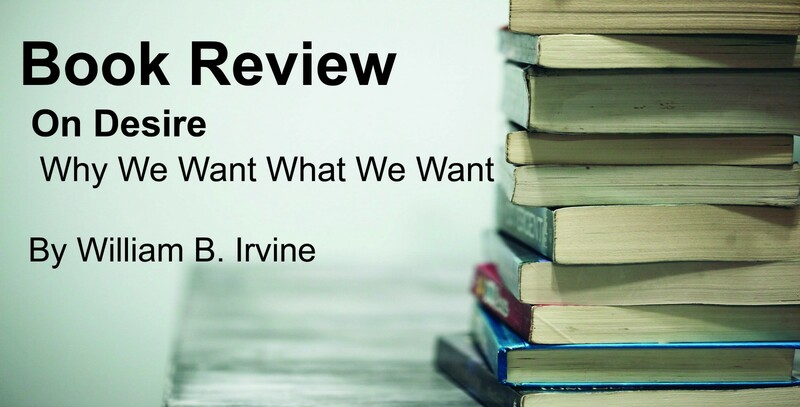 Irvine has written two books that have helped me and many others. This is the first. The second, on Stoicism, will be reviewed at a later date. What makes the second book so helpful is the fact that Irvine mines all the beautiful literature of the Stoics to glean some really great rules for living. He does that here, too, in On Desire. In this particular work, the rules come from a broad range of philosophy; it makes for a nice buffet. But what I appreciate most is the practical nature of what he shares. And the intellectual honesty. Note the quote above and the use of the term “semiarbitrary”. If you read enough philosophy and self-improvement books, you find a standard pattern emerge. Just as every cake, regardless of type, needs flour and some form of fat and some form of liquid, every well-lived life has similar components that appear to be universal. I’ve come to see that you don’t need overwrought, byzantine rules. Nor must these rules be grounded in some mystical form. They can be, sure, but it isn’t necessary. Eat right, get rest, take care of friends and family, do good work, exercise. This is the stuff of Scott Adam’s book (link to the review) and these are great desires to have. From these five major themes, you can dive into the finer points of a broad variety of subsystems. Paleo versus Keto for diet, HIIT versus 5x5 for exercise, the collective works of Ticht Naht Han or Eckhart Tolle or the Bible for taking care of others. It’s all there. Or you can simply operate by these five basic rules, trusting your intuition and maturity, and leave it at that. The point is that rules, be they simple-and-few or complex-and-many, are vital to identifying good desires from bad desires. If you adhere to the strict rule of eating right, common sense will tell you that the chocolate cake is no longer acceptable. You know it’s the wrong desire to have and now you can work on suppressing it. At all times. Just don’t do it. Not even on a cheat day. This is where desire is so deeply incessant and insidious. It’s all these mild desires that we wrestle with. Just this once, I’ll have the chocolate cake. Just this once, I’ll engage in gossip. Just this once, I’ll take a day off from my writing even though I said I never would. I don’t really want to be a puritan about this but Irvine convinces me, everytime I reread the book, about the beauty of the ironclad rule devoid of exception. Being devoid of exception is to be devoid of the struggle that comes from “incessant choice”. The Amish point out that what greases slippery slopes is not logic but human psychology. While it is true that people can remain indefinitely at the top of a slippery slope, most people don’t remain there. They take one seemingly innocent step and before they know it they are picking themselves up at the bottom of the slope. This is really rich. Think about how we use the “cheat day” or other such rationalizations to help us navigate the slippery slope. We tell ourselves this is all logical. If we restrict craven desires for a few days, we can indulge them a few days and have an even balance in our Bank Account of Life. But even if it makes us a wee bit happier in the moment, it doesn’t ever seem to last. These desires remain constant. Our struggle thus remains constant too under the weight of incessant choice. This is one reason why desire is at the root of suffering. It promotes constant choice, a wrestle of discipline and freedom, and search for constant exceptions against our own best interests. A person’s master, says Epictetus, is someone who has power over what he does or does not want, either to obtain it or take it away. Whoever wants to be free, therefore, let him not want or avoid anything that is up to others. Otherwise he will be a slave. My greatest skill has been to want but little. In devising our life plan, what should be our grand goal in living? It should be the attainment of satisfaction. Most of us aren’t interested in satisfaction. We are instead interested in “success”, which not only is different from satisfaction but is to a considerable extent incompatible with it. There is a very real distinction between success (i.e., getting the thing you wanted) and satisfaction. Consider the Rolling Stones. I mean, the song says it all. They can’t go no satisfaction. Despite being one of the most successful music groups of all time. Minor quips aside, Irvine provides some really great thoughts on what satisfaction really is. I love his thoughts on the topic and I won’t spoil it here. You’ll do yourself a favor if you read the book, learn more of what he has to share, and apply it to your own efforts. I think he’s talking about satisfaction. Either synonym gets at the heart of Irvine’s thesis. I’m grateful he’s shared it. I’ll try my best to not forget it. Here’s a link to the book on Amazon. The best way — indeed, perhaps only way — to attain lasting happiness is not to change the world around us or our place in it but to change ourselves. No key ingredient of happiness is missing. A considerable portion of human behavior is motivated by a desire to generate negative feelings in others. We are more interested in the positional value of our possessions than in their absolute value. It is far easier to stifle the first desire than to satisfy all the ensuing ones. Hedonic terminal desires and nonhedonic terminal desires. Desires formed by emotions are highly motivated. We do not have one inner self; we have several, and they are capable of making contrary choices. Adaptation: we tend to get used to what we have and therefore like it less with the passage of time. Miswanting and adaptation lie at the heart of human insatiability. Decision theory tends to work best for trivial decisions, such as in games. For life’s biggest decisions, such as whether or not to get married or have children, it’s pretty much useless. Computers need a motivating force before they do anything. Wealth rarely compensates one for the drudgery necessary to acquire it. We shouldn’t trust our desires. Know that our desires don’t exist in isolation.